The deadline is fast-approaching for undergraduate students to submit their team proposals to NASA’s Reduced Gravity Education Flight Program. Proposals must be received by 11:59 p.m. CDT, Wednesday, Oct. 27. 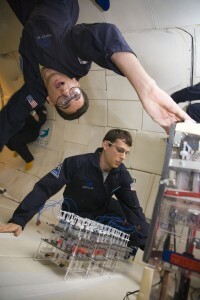 NASA’s Reduced Gravity Education Flight Program gives aspiring explorers a chance to propose, design and fabricate a reduced gravity experiment. Selected teams will get to test and evaluate their experiment aboard a modified Boeing 727 jetliner provided by the Zero-Gravity Corporation of Las Vegas. Zero-Gravity Corp. will conduct the flights in cooperation with the Reduced Gravity Office at NASA’s Johnson Space Center in Houston. The aircraft will fly approximately 30 roller-coaster-like climbs and dips during experiment flights to produce periods of weightlessness and hyper-gravity ranging from zero gravity to twice the Earth’s gravity.